More than 20 years ago, PowerBoss introduced the TSS 82—the first ever Total Sweeper/Scrubber. Five years later, the Armadillo series revolutionized the market introducing features never before available for industrial sweepers. Today’s heavy -duty, low-maintenance Sweeper/Scrubber, The Core 50, continues this tradition, combining innovation with exceptional value designed for years of highly productive and dependable performance. Saves time and labor, able to sweep a 1920 mm path at rates up to 12,200 sq metres per hour. 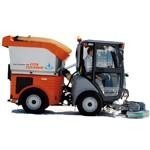 The Core’s ability to U-turn within a 3 metre aisle ensures maximum cleaning productivity. The innovative swing squeegee system tracks the scrub path to control solution, leaving the floor dry and safe for traffic. The Core’s unique filter system captures fine dust as the scrubber powers away dirt and grime from indoor and outdoor surfaces. Compact machine makes for outstanding maneuverability and increased productivity. The unique bladder-style tank design allows for a large capacity in a small space. Features a Rotary Trash Re-locator (RTR) providing maximum hopper storage through compaction and relocation of debris. The unique pre-filter design and large panel filter area combine to provide outstanding dust control for all sweeping environments. It’s patented swing out engine adds further value by reducing R&M costs. Allows for complete access to all major servicing components making routine maintenance quick and easy.